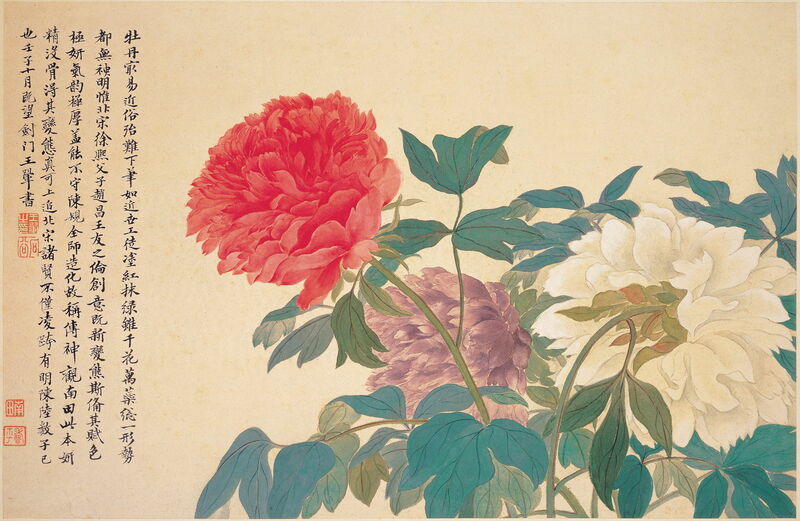 Yun Shouping 惲壽平 (1633–1690), 牡丹 Peonies (date not known), ink and colour on paper, 28.5 × 43.1 cm, National Palace Museum 國立故宮博物院, Taipei, Taiwan. Wikimedia Commons. Yesterday, I commemorated the three-hundredth anniversary of the death of one of the Six Masters of the early Qing period in China: Wú Lì, promising today to show the work of the other five. Wáng Shímǐn 王時敏 王时敏 (1592-1680) was one of Wú Lì’s Masters, and the oldest of the six. He originally worked as a government official, but fell ill in 1630 during a visit to Nanking. He then devoted himself full-time to his art. His grandson was Wáng Yuánqí, another of the Six Masters. Wang Shimin 王時敏 (1592-1680), untitled lead from album of 12 leaves illustrating Du Fu’s poems (1666), ink and colour on paper, 39 x 25.5 cm, location not known. Wikimedia Commons. This painting by Wáng Shímǐn is an untitled leaf from an album of twelve leaves in which he illustrated poems by Du Fu, from 1666. Wang Shimin 王時敏 (1592-1680), after Wang Wei’s ‘Snow Over Rivers and Mountains’ (1668), colour on paper scroll, 133.7 × 60 cm, National Palace Museum 國立故宮博物院, Taipei, Taiwan. Wikimedia Commons. 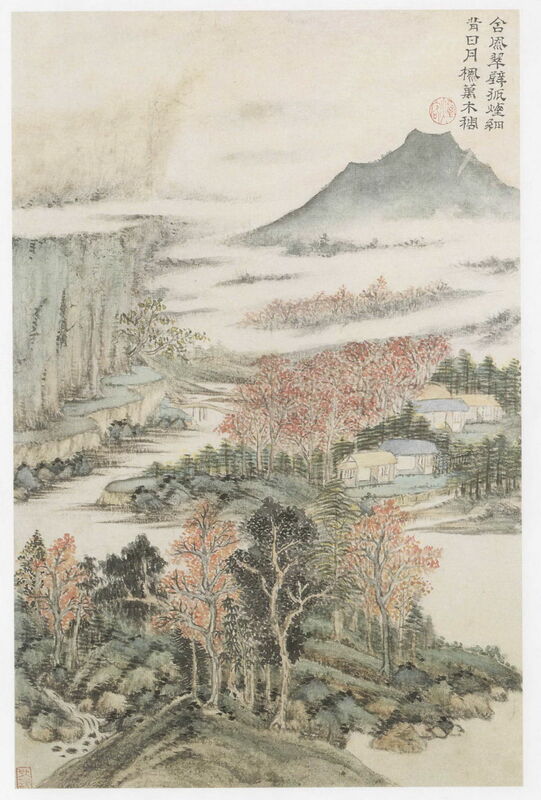 In this, Wáng Shímǐn has painted after Wang Wei’s Snow Over Rivers and Mountains (1668). 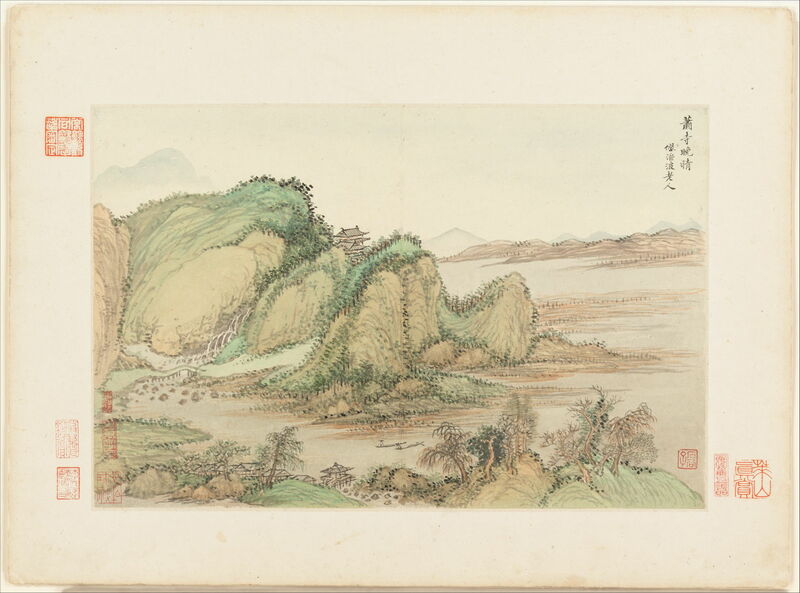 Wang Shimin 王時敏 (1592-1680), 仿古山水圖 Landscapes after Old Masters (1674-77), ink and colour on paper, 25.4 x 33 cm, Metropolitan Museum of Art, New York, NY. Wikimedia Commons. In 1674, Wáng Huī painted an album of twelve paintings for his Master Wáng Shímǐn, who three years later responded in his own album, which included this painting. By this time, Wáng Shímǐn had grown old, and his ageing eyesight led to a broader style. Since then, individual leaves from those two albums, by Master and pupil, have become lost, and a single composite was created, in which there are ten surviving paintings by Wáng Huī, and two by Wáng Shímǐn. Wang Shimin 王時敏 (1592-1680), untitled folding fan mounted as an album leaf (1677), ink and color on paper, 15.7 x 49.5 cm, Metropolitan Museum of Art, New York, NY. Wikimedia Commons. This untitled folding fan was painted by Wáng Shímǐn in 1677. Wáng Jiàn 王鑒 王鉴 (1598-1677) was the second of Wú Lì’s Masters, and the other of the Six Masters from the first generation. I have been unable to find any usable images of his work. Wáng Huī 王翬 王翚 (1632–1717) was from the next generation, which included Wú Lì, with whom he shared a Master, Wáng Shímǐn. Wang Hui 王翬 (1632–1717), The Southern Journey of Emperor Kangxi (detail) (1691-98), colour on silk scroll, Palace Museum 故宫博物院, Beijing, China. Wikimedia Commons. This detail from Wáng Huī’s The Southern Journey of Emperor Kangxi shows one of his populated landscapes, and was painted between 1691-98. 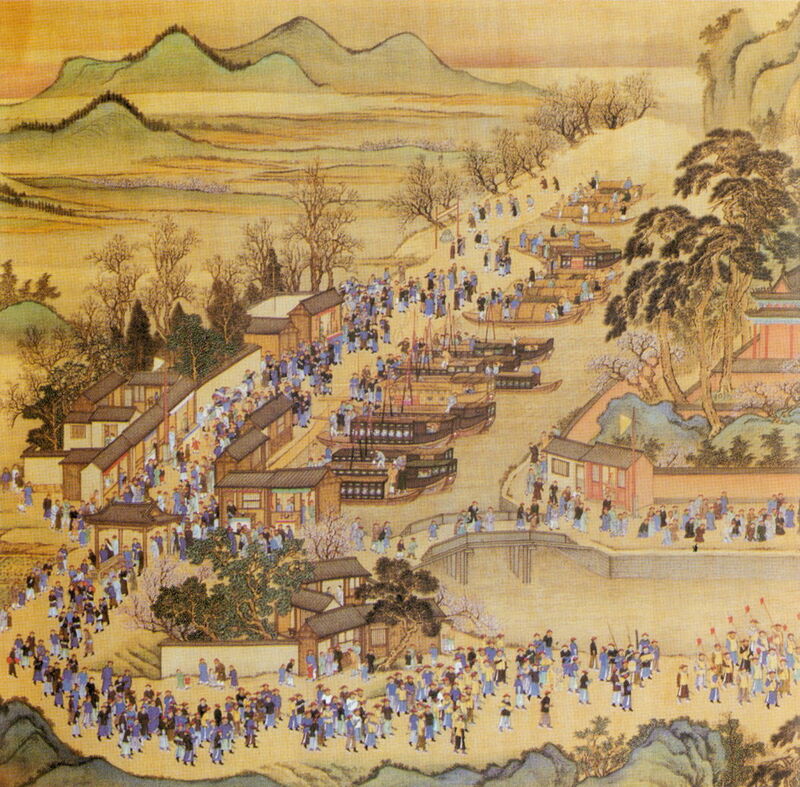 Wang Hui 王翬 (1632–1717), 等 康熙南巡圖 （卷三: 濟南至泰山）The Kangxi Emperor’s Southern_Inspection Tour, Scroll Three – Ji’nan to Mount Tai (1698), ink and colour on silk scroll, 67.9 x 1393.8 cm, Metropolitan Museum of Art, New York, NY. Wikimedia Commons. The third of a series of scrolls showing The Kangxi Emperor’s Southern Inspection Tour, this shows the section from Ji’nan to Mount Tai, and was completed in 1698. Wang Hui 王翬 (1632–1717), A Dream Journey to the Mountains and Rivers (1702), ink on paper scroll, 24.2 x 379 cm, Hong Kong Museum of Art 香港藝術館, Hong Kong. Wikimedia Commons. Wáng Huī’s Dream Journey to the Mountains and Rivers is one of his later paintings, from 1702. Yun Shouping 惲壽平 (1633–1690) was originally a landscape painter, but when he saw the art of Wáng Huī, he felt that his paintings could only be second best to those. He then changed direction, and became one of the great flower painters of China. He founded the Ch’ang-chou school of painting. His undated Peonies is a good example of his bold use of colour, and the high botanical quality of his work. Yun Shouping 惲壽平 (1633–1690), Sunset Along the Floral Embankment (1671), media and dimensions not known, Kyoto National Museum, Japan. Yun Shouping’s later Sunset Along the Floral Embankment from 1671 shows a compromise between the floral and landscape. Wáng Yuánqí 王原祁 (1642–1715) was taught to paint by his grandfather, Wáng Shímǐn. He became a court official to the Qing Emperor Kangxi, whose responsibilities included curation of the imperial collection. Wang Yuanqi 王原祁 (1642–1715), Free Spirits Among Streams and Mountains (detail) (1684), ink on paper scroll, 33 x 710.9 cm, Walters Art Museum, Baltimore, MD. Wikimedia Commons. Two details (above and below) from Wáng Yuánqí’s long handscroll of Free Spirits Among Streams and Mountains, painted in 1684, show an immature style influenced strongly by his Master Wáng Shímǐn and Huang Gongwang. Wang Yuanqi 王原祁 (1642–1715), The Fuchun Mountains (1699), ink on paper, 33.8 x 393.7 cm, National Gallery of Victoria, Melbourne, Australia. Wikimedia Commons. Wáng Yuánqí’s The Fuchun Mountains from 1699 is more typical of his mature style, and strongly influenced by Huang Gongwang’s great handscroll of Dwelling in the Fuchun Mountains of 1350. I hope that this quick dip into paintings from the early Qing dynasty has provided better context for the previous article on Wú Lì, and perhaps encouraged you to look afresh at these neglected artists. Posted in General, Life, Painting and tagged botanical, Chinese, floral, landscape, Li, painting, Qing, Six Master, Wáng, Wu, Yun. Bookmark the permalink.